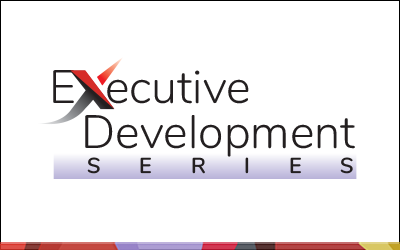 The Executive Development Series (EDS) is designed to help mid-career professionals build skills that are critical to effectively delivering results within their organizations, with a focus on mastering competencies vital to success at the director and VP level. The two seminars of the series, Leading with Power and Authenticity and Executive Leadership Presence, may be taken in any order. This educational program is the original Executive Development Seminar. Educational program added to the series in the fall of 2012. Executive Leadership Presence is designed to develop Leadership Presence as a means to inspire confidence, engage and influence others, and maintain productivity while increasing visibility and career mobility. This two-day program will introduce participants to a unique framework and toolkit of 21 specific attributes, skills and thought processes that work together to help them build knowledge and expertise. Each program within the series stands independent of the other and may be attended in any order. Seating is limited in both programs and registration will be on a first-come, first-served basis. If you attended the Executive Development Seminar prior to 2012, you attended Leading with Power and Authenticity. Seats are limited in both programs and registration is on a first-come, first-served basis. Registration for LWPA Fall, 2019 is now open . Registration for ELP 2019 is now open. *We want to notify you in advance that by attending, you understand and agree that your voice, image and person may be used in accordance with the program or promotion. For questions regarding the program, please contact Megan Marksberry at 202-827-4789 or email events@wict.org. For questions regarding your registration, please contact Donna McDonald at 202-827-4​787.